Weapon(s) of choice Bo Staff, Turtle Fist Daggers, Mutant Machine Gun, Dino Horned Knuckle Duster, Jawbone Hatchet, Pterano Bo Steel Core Reinforced Battle Bos, Ice Skate Battle Blade, Sword, Kowabunga Cool Extinguisher Gun, Mutant Grapplor, Shreddin’ Hand Razors, Super Spy Pistol, Medieval Mutant Mallet, Sewer Spiked Big Battle Bo, Knight-knockin’ Knife Killer Pizza, Sewer spiked Clobber Club, Diabolical Dragon Blade, Pepperoni Poppin’ Pistol, Pizza Batter Bo Fish Knife, Foot-shreddin’ Knife, Slicin’ Stars, Laser Missile, Turtle Pizza Disc, Sewer Slingshot, Shark Fin Hatchet, Mutant Revolver, Blaster, Ninja Stars, Kama, Mystic Fire Burnin’ Bo Staff, Byakka, Ninja Tek Bo Staff, Club, Exo-Suit, Uzi, Harpoon Blaster, Olympic-level-athletic skill, Mastery of Ninjutsu, Genius-level intellect, Mastery of Kobudo and Bojutsu, Technological know-how, Ground Claw, His many myriad inventions. Weight 145 lbs., 155 lbs., 170 lbs., 180 lbs. Donatello (Don or Donnie) is a fictional character and one of the four main characters in the Teenage Mutant Ninja Turtles comics and all related media, he sports a purple bandana. His signature weapon is the bō staff. In all media he is depicted as the most knowledgeable of the four turtles, often speaking in technobabble with a natural aptitude for science and technology. He is the third oldest brother out of the four. He is named after the sculptor Donatello. Donatello (nicknamed ‘Don or Donny) is the brains of the team. It seems when Donatello was young he used to build his own (and his brothers’) toys. No one knows the exact age he found out he was a natural technician, but when he did, he was the one who hooked up the electricity and fixed all of the junk from the sewer into their own furniture and supplies. When the other turtles would practice their ninja skills during free time, little Donny would be tinkering with some kind of mechanical device. Even from day one, Donatello has been one the world’s most lovable tech-geeks. Donatello is typically the calm, logical Turtle. He is often in good terms with all his brother and seems to be very close toMichelangelo. His favorite music is classical & classical rock, his favorite book is A Brief History of Time by Stephen Hawking. Donnie is described as the “brain” of the TMNT, he is fairly studious and industrious, and a reasonable “Mr. Fix-It”. Donatello has a knack for inventing cool new gadgets and machines. He is considered the most reserved out of the four turtles. He would rather talk things out than fight and uses violence as a last resort. Though he is often portrayed as being more focused on his studies than ninjutsu training, Donatello has shown himself to be a very capable fighter, in particular, when he is in a life-or-death situation. He can set up plans as quickly as Leonardo, if necessary, though they usually centre around one of his inventions or something else that would bar Leonardo from knowing the ins and outs of the plan in question. It is presumably for this reason that Donatello is often viewed as the level-headed second to Leonardo’s command. In the comics Donatello is originally presented along with Leonardoas one of the two calmer turtles and while the originals have no official command structure, in the early stories he is depicted as the second in command. In the first issue he is the one that killed theShredder by knocking him and his grenade off the roof. The second issue elaborated more on each turtles personalities and opened with Donatello soldering a circuit. Later in the issue Donatello states that he is “familiar with some computer systems” and helps April O’Neil deactivate the Mousers. In the Donatello one shot, Donatello encounters an artist called Kirby(an homage to the comic artist Jack Kirby) whose mysterious crystal brings his drawings to life before disappearing. The two newfound friends journey to a dimension inhabited by Kirby’s creations and help the heroes defeat the invading monsters. During the turtles’ exile to Northampton Donatello becomes obsessed with fixing up and repairing the many broken things within the farmhouse they were living in. Most notably he spent days and nights fixing the boiler to give his family hot running water and builds a windmill and a water wheel to provide electricity. He also finds an old type writer and writes his own personal credo. In “Shades of Grey” Casey Jones encounters the turtle by a ravine as he was pondering “the fractal structure of natural patterns”. Casey accuses the turtle of using big words and acting better than everyone else. Donatello suggests they should continue the conversation when Casey is sober. Grabbing a stick, an angry Jones continually pokes the turtle until he loses his temper and sends Casey careening into the water. In City at War the turtles return to New York to put an end to theFoot Clan’s civil war. During a battle with Shredder’s Elite Guards in the ruins of the Second Time Around Shop Donatello falls through the floor and breaks his leg. Seeing their ally Karai subdued and about to be killed, Donatello grabs one of the Foot’s machine guns and repeatedly shoots the Foot Elite. Donatello is visibly shaken by the violence and throws the gun away. At the end of the story the turtles, April and Casey move back New York save for Donatello who chooses to stay in Northampton withMaster Splinter to heal from his injury as well as to reflect on everything that has happened. While meditating with Splinter, Donatello receives a vision of the future where he is in the village of Chihaya inJapan. When Donatello asks what he would be doing there, his master simply replies “To bury me”. After encountering the vigilante Nobody in civilian guise, Donatello returns with him to New York to help his brothers battle Baxter Stockman. In the current comics Donatello finds an armored truck in the sewers which apparently had been part of a bank robbery in the sixties. Along with Raphael and Casey Jones, he undertakes the task of fixing up the vehicle. After the death of Splinter, Donatello secretly goes to his body and asks forgiveness before clipping something off him. Shortly after, Donatello decides to accompany the Utroms on a mission to Tepui to search for two missing research teams. The group is attacked by strange wooden creatures who shrink them to miniature size. The creatures turn out to be a group of Utroms which had been stranded in the jungle during their first stay on Earth and had been living in secret thanks to their Quantum Inversion Redimensioning Device, which could alter their size. The process could not be reversed on Donatello, possibly due to his mutation, leaving him the size of an action figure. While the Utroms work on returning him to normal, Donatello puts his new size to use infiltrating a terrorist organization’s warehouse. He’s also made a robotic body for himself made to resemble a turtle to help him move around. Donatello was the most scientific minded turtle, and was responsible for the creation of most of the Turtles high tech equipment, including the TurtleVan, the Turtle comms, and the Turtle Blimp. He also managed to build a working inter dimensional portal though it is unknown how he found the necessary equipment to do so. He also thwarted a super knowledgeable Slash without any assistance. He wore purple and, as with his other incarnations he carried a Bo staff. He was voiced by Barry Gordon. The running gag in the show was that Donatello’s inventions usually had the habit of breaking down or blowing up at his face, although there are many times the team rely on him whenever they were faced with scientific or mechanical problems. The 1987 series briefly hinted of Donatello’s vocal reluctance to the group’s role as crime fighters and helping humans in particular, both in the five pilot episode and a plot point in the “Red Sky” episode Cry HAVOC. He seemed to be the least interested among his brothers towards human culture, and even reflected if being a normal turtle would have given them a much easier life. Despite this, it never deterred him from appreciating human food such as pizza, and even bothered to get himself a college degree through mail. On the rare moments when Leonardo was kidnapped or incapacitated, Donatello usually takes on the role as the group leader. In the film Turtles Forever he was the one who created the Trans-Dimensional Portal Stick in order to reach theTurtle Prime Universe. When his skeptical 2003 counterpart (whom he fondly nicknamed “Mr. Wizard”) voiced his concerns over calling a wrench a hammer, Donatello replied that science was more than just facts and details. He was voiced by Tony Salerno. Don played keyboards and background vocals in the stage show. In the second movie his knowledge and scientific originality were brought to the forefront and he was instrumental in developing the anti mutagen that revertedTokka and Rahzar to their animal forms. As further evidence of his mechanical inclination, he is also shown hacking into a computer at T.G.R.I. There is also evidence in this film that Donatello shows great emotional support for his little brother, Michelangelo, in a more obvious way; unlike Leonardo and Raphael. Mikey tried making his brothers laugh by imitating a quote from the movie, “The Karate Kid” with his own “wax on, wax off..” routine. Of course, Raphael was the one to bully Michelangelo, as Michelangelo said, “wax on…” Raphael then interrupted, teasing “mouth off!”, thus urging Donatello to confront a rather disappointed Michelangelo and trying to comfort him with a friendly pat on the shoulder, and comfortingly stating, “everybody’s a critic.” He also related to Professor Jordan Perry on a personal and professional level, as they both rack their brains to create an anti-mutagen for Shredder’s newly evolved mutant-monsters. In the third, and final, live action film, Donatello’s knowledge comes to the forefront in explaining the principals of the time machine that sends the turtles back to ancient Japan. As he tells the other turtles, for every person that is sent backward in time, another person must be sent forward in time. Therefore, the time machine, a sceptre, must be held by the same number of people in both the past and the future for the “cosmic trade” to be made. Donatello’s insight’s allows the turtles to return to modern day New York. . Continuing the trend of being able to relate to humans(and all three of his brothers) better than any of the otherTurtles, Donatello was put in charge of keeping the group together in Leonardo’s absence. Although he tried his best, the three were moving in separate directions with their lives. Both Michelangelo and himself got jobs dealing with the public, while Raphael spent his nights fighting crime. Donatello worked at an IT Tech Support. In the Image Comics incarnation of the TMNT, he became a cyborg after his body was partially destroyed from being shot and dropped out of a helicopter (he maintained a positive attitude nonetheless, although he was constantly at risk of losing his mind to the cyborg half). The Image Comics were later treated as non-canon by the Mirage Publications. 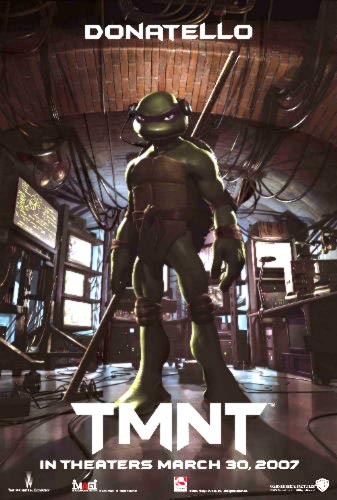 Donatello in Ninja Turtles: The Next Mutation is voiced by Jason Gray-Stanford. In the Next Mutation Donatello uses a shorter metal version of a bo-staff. Also in the show, he is a lot more knowledgeable and is more concerned on what is controlling the lair, science or magic which leads him to constantly arguing with Venus De Milo. Like in the Mirage comics, Donatello has a complex personality in the 2003 animation and thus is a popular character. Several episodes concentrate on him, as well as his emotional and intellectual struggles. He was voiced by Sam Riegel. As in his other incarnations, Donatello is knowledgeable, a skilled technician and tinkerer, and very introspective, frequently becoming pensive over things he doesn’t understand. He typically has a very close, however platonic, relationship with April. He also displays closeness with Michelangelo akin to that seen in the original movie. Even more pacifistic than his other incarnations, Donatello shows a greater interest in technology than his ninjutsu training. During his first Battle Nexus Tournament, despite being a very gifted ninja, he lost in the first round of the competition. Even so, Donatello will defend his brothers at any cost, and he frequently assists the team in many ways through the technology he develops, mostly vehicles and communication devices. In this series’ incarnation, Donatello is generally well-liked by all of his brothers, never engaging in major confrontations with them. In fact, Donatello was the one to reunite his brothers against the Shredder in the episode “Same As It Never Was.” His skin color is a light, brownish green color; this particular color is only used for him in the 2003 animation. In the fourth season, he was infected by a monster, and in the episode “Adventures in Turtle-Sitting”, he mutates into a monster himself (which happened to Raphael in the Mirage Comics). Donatello became one of the Ninja Tribunal’s Acolytes along with his brothers. He was the first ninja shown to focus his spiritual energy through his Amulet of the Acolyte. This is perhaps due to the fact that the Acolytes training began with studying in a library, where Don enthuiastically absorbed knowledge of the secret arts. His spiritual avatar is that of a dragon. A time window malfunction (that turned it into a time machine) caused Donny, his brothers, and Master Splinter to be “fast-forwarded” to 2105, hence the show’s name “Fast Forward”. Donatello was one of two Turtles, alongside Michelangelo, that adapted best to the new lifestyle of the future. He was extremely interested in the new technology and quickly bonded with Cody Jones. Using his ideas, Cody had made many new, high-tech turtle weapons and vehicles. In the episode “The Journal”, which features the Turtles going back to their own time, he uses his knowledge of the future to build new gadgets such as a fusion generator. After a long time, Cody and Don were able to finish repairing the time portal and were finally able to back to their own time. Unfortunately, Viral took overSerling and sent them jumping around time until Donny managed to repair Serling enough to create another time portal to their own time. But Viral took control of Serling again and was about to blast the Turtles, but Splinter took the blast. Donatello was devastated by the loss of his teacher and father, and for some time was obsessive with gathering up all of Splinter’s bits in order to restore him; constantly blaming himself for the incident. After some time when Don was faced with the choice of saving his brothers or gathering more of Splinter’s bits, he realized that he should be there for his brothers more often. In the episode “Web Wranglers”, Raphael has stated that Don has an IQ of 637 – a likely highly inflated stat. It should be noted that Don was the one who killed (with Splinter) the Cyber Shreder by blasting him with the same energy beam Viral shot at splinter at the beginning of the season. After that, he sees Casey and April getting married. [April and Casey fight then go into different rooms, slamming the doors after them] Gosh, it’s kind of like Moonlighting. Isn’t it? These nets are very effective and very well constructed. You were expecting maybe the Addams Family? Mud wrestling is definitely a spectator sport. Do you think I could *possibly* live without a single microchip? [Acting as a technical consultant over the phone] Sir? Sir. Sir. Did you turn the computer on? Have you plugged it in? Yeah, that would help. No, I’m not playing hard to get. I’m telling you, sir, it’s not that kind of phone line. I’m not your enemy. I’m just Donnie, your friendly IT tech support here to help you 24-hours a day, sir. Yeah, I’m sorry. Ma’am! [examining a dart taken out of Raphael] Yep. This has Winter’s name written all over it. Mirage Donatello: What’s with the multi-coloured headbands? These mousers are incredible! The servo mechanics, the circuitry, the articulation…! Too bad he had such a rotten parent. [after beating the Purple Dragons] Well, that was easier then expected. Given his knack for invention it is ironic that Donatello is not named after the painter also known for his inventions and advancements in technological thinking. Live Action Donatello is not so smart but it developes in the second and third. Live Action Donatello also has a good friendship with Casey Jones but in all three movies Donatello is a fun loving turtle like Mikey. Donny is also like Drako and Warrior Dragon in SSB 4, they are all red and wear purples masks. He is co-creator Peter Laird’s favorite Turtle. The most famous historical bearer of this name was the artist Donatello (Donato di Niccolò di Betto Bardi). Donatello was one of the most influential painters and sculptors of the Italian Renaissance, though is perhaps best known today for giving his name to one of the Teenage Mutant Ninja Turtles.